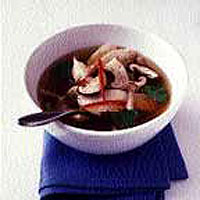 This delicious, light, steaming soup will clear the head and stimulate the palate. Chillies are natural painkillers, stimulate the metabolic rate and aid digestion. Put 2 peeled, sliced garlic cloves, 2 slices of ginger (the thickness of a £1 coin) and 3 wide strips of lime zest into a pan with 500ml chicken stock. Bring up to the boil. Simmer for 3 minutes, then fish out the garlic, ginger and lime zest. Add half a finely sliced raw chicken breast to the boiling stock, and simmer for about 3 minutes or until cooked. Add some finely sliced mushrooms and half a finely sliced chilli and cook for a further 2 minutes. Remove from the heat, add the juice of half a lime, some coriander sprigs and serve.